It is a cervical stretching device that decompresses the neck when placed under the neck to reduce neck pain, pressure and headaches. If you’ve been looking for a convenient and effective solution to neck pain and headaches that bog you down, try Neck Renew. It is a skilfully crafted cervical stretching device that you just need to bend and keep behind your neck. You do not have to do anything else, as it opens up on its own, stretches the muscles and ligaments around the spine while increasing the space between the vertebrae. Neck Renew, as per the claims made by its makers, relieves you instantly of the stress that painful joints and muscles cause and provides relief from neck pain, headache and tension within minutes. Neck Renew is a soft, lightweight and flexible stretching device having foam construction that does not entail use of any drug or medical procedure. Further, Neck Renew is a non-invasive tool, and all you have to do is just bend it and keep it under your neck. That, according to its creators, makes it a wholly safe solution which guarantees desired results without any external support. Neck Renew is a simple, portable and lightweight tool which can be carried and used anywhere. It is compact and handy, so you can take it wherever you go and use comfortably anytime. It feels just like a having a soothing massage while working on your neck and shoulders in the most appropriate way. 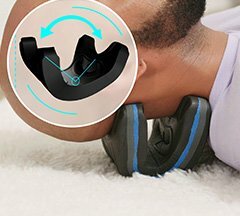 You just need to relax as Neck Renew goes about gently stretches your stiff neck and expands the space between vertebrae. In addition, Neck Renew also supposedly helps Improve posture, spinal alignment and boost blood flow. Be the first to comment on "Neck Renew REVIEW"